All transactions are safe and secure with a reliable history in online purchasing behind each of our associates. 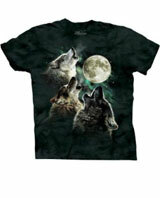 Buy the Dwight Schrute Three Wolf Moon t-shirt to own Office clothing and merchandise. Dunder Mifflin Paper Company's Scranton Branch is home to the company's best employees, including the Assistant (to the) Regional Manager, Dwight Schrute, and his boss Michael Scott. If you thought your Dunder Mifflin t-shirts attracted attention, behold the magical powers of Dwight Schrute's Three Wolf Moon tee, which according to internet folklore will cause the wearer to be immediately approached by women. Dwight believes that its powers helped him to pick up Pam's best friend. In addition to the Dwight Schrute Three Wolf Moon tee above, browse the Office Clothing Gallery for more apparel like men's and women's clothes, kids shirts or hoodies.